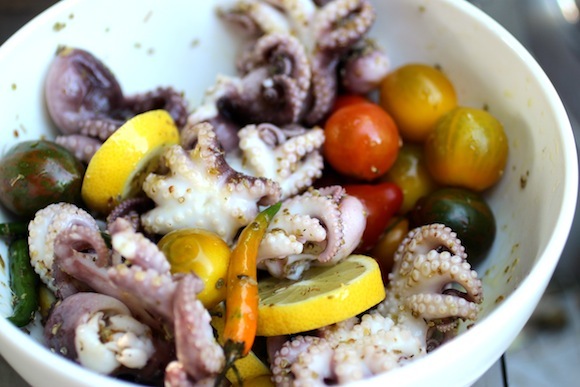 Place cleaned baby octopuses in a sauce pan and cover with water. Add a splash of white wine and a good squeeze of lemon juice. Cover and bring to a simmer, cooking about 20 minutes until the octopi are fork tender. Remove them with a spider or strainer. Let cool to room temperature. Place octopodes in a bowl with lemon wheels, baby heirloom tomatoes, chilies (either Thai, Serrano, Jalapeño, Shishito). Coat with olive oil, lemon juice, dried oregano, salt, pepper. Let marinate while the grill gets hot, then place the medley in a grill basket in a single layer, and cook over high heat, flipping occasionally, until it all starts to char. 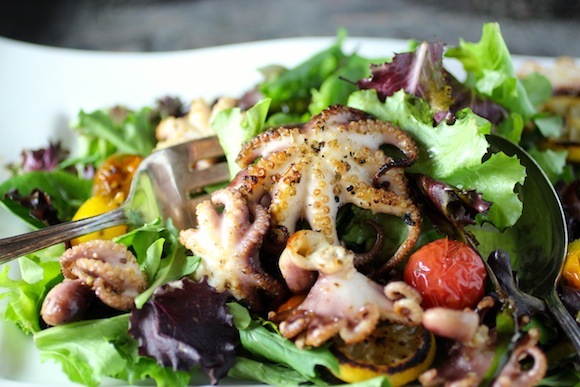 Serve the hot octopus medley over lightly dressed mixed lettuces. Serve with extra dressing on the side. So, just for fun, I used them all. In addition, the plural doesn’t sound right for a menu item, hence the post title is singular. What do you think? 1758, genus name of a type of eight-armed cephalopod mollusks, from Gk. oktopous “eight-footed,” from okto “eight” (see eight) + pous “foot.” Proper plural is octopodes, though octopuses probably works better in English. Octopi is from mistaken assumption that -us is the Latin noun ending that takes -i in plural. 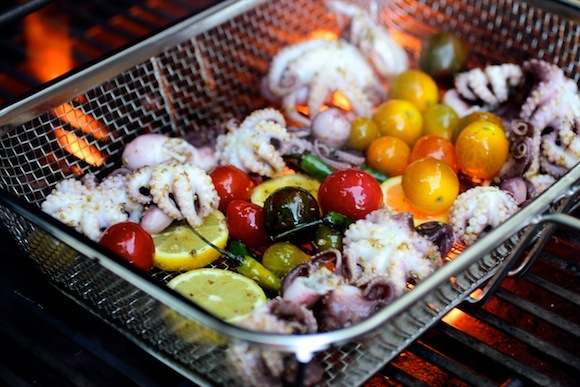 In any event, be sure to enjoy charred octopus, octopuses, octopi, or octopodes this summer! You’re killing me … first the oysters, now the squid. 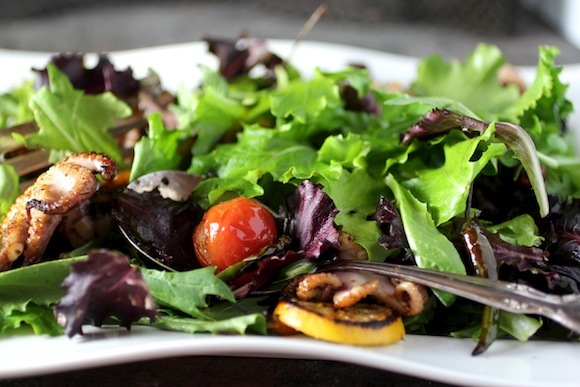 That is one gorgeous salad! Pinning for sure. This is a beauty! I’m pinning it too! What a beautiful simple salad of one of my very favourite things to prepare and eat 🙂 ! My ‘learning’ tells me ‘octopi’, my feelingworld says ‘octopuses’ in this instance is ‘good enough’! Octopodes? Well, I thought we were kind’of foodies and not quite ‘scientists’ whatever our background ? 🙂 ! 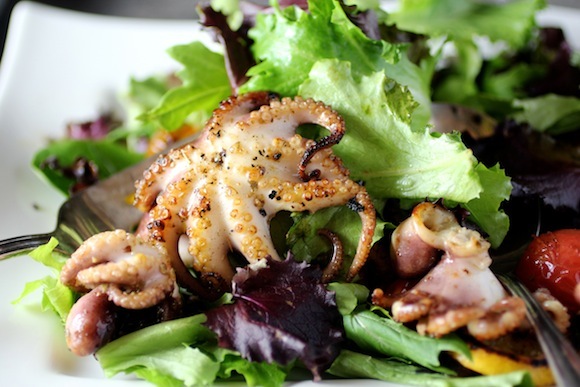 Your octopus salad is simply gorgeous. I can’t usually find the baby octopi around here, but the regular size will have to do. I was inspired by your calamarata Linda! Hi Greg – I get them (along with lots of other hard to find seafood) at Market World. A huge Korean supermarket on Sepulveda in Torrance. I bet you can find them at any of the bigger markets in Koreatown, closer to you up there. The best place is 99 Ranch Market, which is a cultural experience in and of itself. Frozen babies and full sized octos, both already cleaned! Tonight we are doing the Feast of the Seven Fishes with each couple preparing the fish of their choosing. 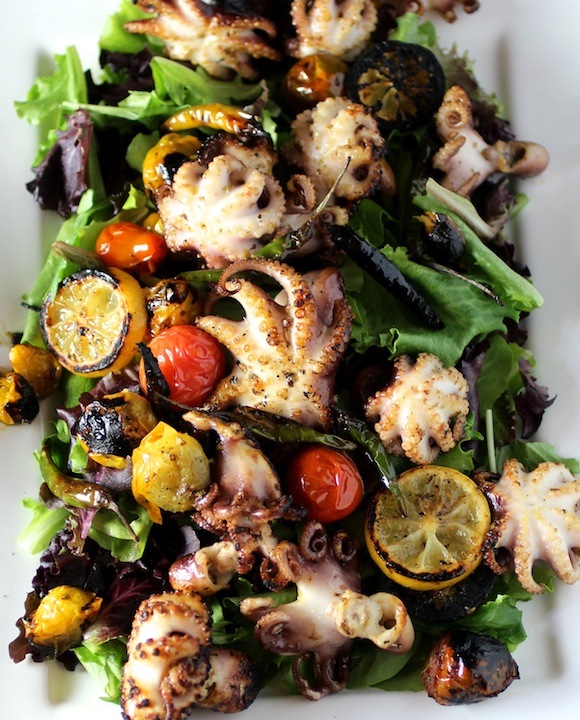 Ours is a Duet of Octopus, with carpaccio and grilled baby octopus! mangia! This looks incredible. It brings me back to all that beautifully simple grilled seafood I’d enjoy living in Italy. And octopus is particularly delectable. It deserves to be much more popular. I think you are such a great inspiration. 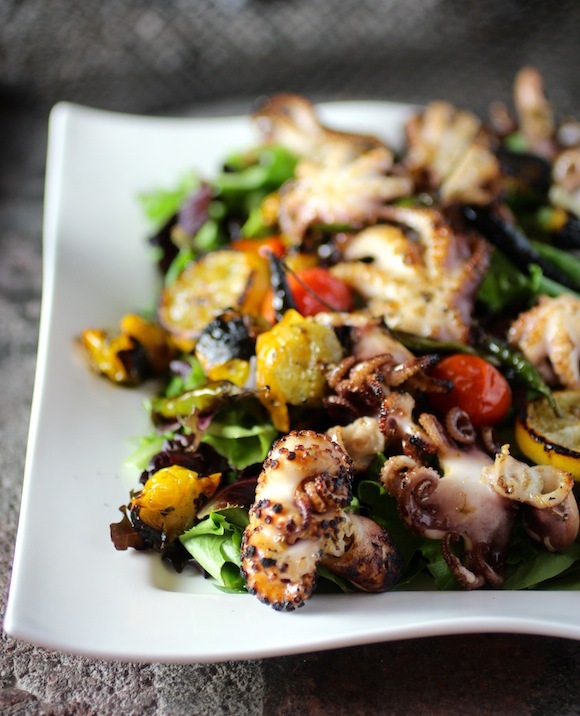 Octopus is all the rage right now and You’ve prepared it so beautifully (as always). Thanks Angela – didn’t know octopus was the rage. Cool!